#1. This is largely a Greek crisis. It was, of course, triggered by seismic changes in the global financial system, but the roots of the crisis can be found in the choices that Greek society has made over the last thirty years. The bankruptcy of Lehman Brothers, the straightjacket of the common currency, and the lack of centralized fiscal powers in Europe – these factors affected how the crisis has been played out, but they did not cause the crisis, nor can they solve it. #2. This is largely a political and social crisis whose most apparent manifestation is debt. 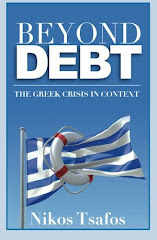 When a country has a lot of debt it is easy to think that it faces a debt crisis, and Greece does face a debt crisis. But debt is a symptom of a sick political system. Debt was the price Greece paid for political normalcy when our government in the 1980s sought to heal political wounds by spending money on those who had been disenfranchised. Over time, profligacy created and perpetuated practices and institutions that made sustained fiscal consolidation impossible. #3. Greece should be judged not just on its fiscal targets but on broader measures of reform and change. In a fiscal and debt crisis, a country needs a credible path to a sustainable debt level. Such targets are easy to measure. But in a country facing a deep social and political crisis, the yardstick for success has to be wider. A plan that pays off debt with no reform – for example selling off state assets – is like giving aspirin to someone with a toothache: it provides relief but not a cure. So Greece should be judged by whether its political economy and its political philosophy are changing. A changed country, not just a less indebted one, is the goal. #4. The best option for Greece to achieve reform is a program along the lines negotiated with the International Monetary Fund, the European Commission, and the European Central Bank (in Greek lingo, the program is called the “memorandum” with the “troika”). This is hardly a popular view. Two-thirds of Greeks (or more) think the memorandum is a bad idea. In some ways, they are right to distrust a program that is inflicting enormous pain, is seen as imposed from abroad and does not offer a clear path out of the crisis. But before judging the program we need to ask two questions: are the alternatives better? And is the memorandum failing because its conception is bad or because it is not being implemented properly. When it comes to options, Greece has two: an outright repudiation of its debt; or a debt default coupled with an exit from the Eurozone. Many economists see the merits of these two options as so self evident that they are puzzled by why Greece would pick to inflict such suffering on the people to implement a program that is sure to fail. However, these economists tend to think of the crisis too simplistically. If debt is the problem, removing debt is indeed a solution. But in a country where there is endemic corruption, constant protests and civil strife, chronic tax evasion, a weak state whose chief purpose is to dole out patronage, and a private sector that is so heavily protected as to mock basis notions of meritocracy, it is hard to see how a default or a new currency are a “solution.” These recommendations start by asking “how can Greece lessen its debt burden” rather than, “what kind of crisis does Greece face?” Different questions, different answers. A second issue is whether the memorandum is doomed to fail or whether it is failing because it is not being implemented well. In some ways, the memorandum is not failing: for example, it is producing big changes in political economy, institutions and practices. But more generally, the government has made its position worse through its lack of political will. By failing to shrink the public sector quickly and by being too slow in reforming the private sector, it has fallen back on repeated tax hikes to plug its fiscal hole. As a result, society’s disposable income has collapsed. It need not be that way, and the government has options to rectify this condition. It could offer a tax break that it could pay for by cutting more jobs in the public sector and by allocating some money raised from privatizations towards tax relief rather than merely paying down debt. More importantly, slow progress on reform has amplified the public’s frustration from a perceived return to preferential treatment and favoritism. No society has much patience for such enormous pain so unevenly spread. #5. Greece is moving in the right direction, albeit slowly and unevenly. This seems counter-intuitive but if one looks above the fray of the everyday noise and onto the big picture, it is easy to see that Greek society is changing extraordinarily quickly. Not all the change is good, of course. There is more crime and civil tension. Health, mental and physical, is deteriorating. Xenophobia could easily mix with loose immigration controls to produce an explosive keg. But the true measure of reform is to assess Greece’s social and political dialogue. Few subjects are taboo any more. A country pushed the brink has no time for political correctness or for niceties; it has no time for diplomacy or for doublespeak. It has to confront reality and it has to deal with it. Of course, reality is not universal – different people have different views about how Greece got into this mess and what is best way to get out of it. But the dialogue has been enlarged in big ways and it is now possible to say things that would have been unthinkable even two years ago. Society is more open to ideas than ever before. This openness can be dangerous of course, and not all ideas floating around are constructive. But there are many ideas that are constructive and several of them are contained in the memorandum that the government has pledged to follow. And that is a promising sign. In a way, Greece is in Purgatory. Our country is divided into those who think that we were in Paradise and are on our way to Hell. The people who benefited from the old system fall into that group. There are those who think we came from Hell and are going back to Hell – these are the pessimists and they have reason to be so. I doubt anyone thinks we came from Paradise and are going back to Paradise. My view is that we came from Hell and have a good shot at reaching Paradise. Oddly enough, Purgatory looks and feels like the reform program that the troika has put in place. Purgatory is no fun but it’s worth going through because of what lies on the other end. At the end of the day, I remain optimistic that we can end up in Paradise. But I won’t be surprised if we do not. A once professor at JHU SAIS was fond of a sentence he attributed to an Iraqi woman: "Under Saddam, we lived in a big prison. Now we're in a kind of a wilderness. I prefer the wilderness." By your analysis, Greece was in a welfare coma, and now it's in a wilderness. - Ireland has seen its tax revenue fall by 25%+ as a result of the crisis. Greece's tax revenues are more-or-less steady. - The U.S., U.K., Ireland, and likely soon France, Spain, Belgium, and Germany will see their "bank bailout costs as a % of tax revenue" skyrocket. Greece's bank bailout has been manageable. A comparative approach nicely demonstrates that Greece is perhaps the only country whose 2008 vintage fiscal crisis is largely of its own making, and is not an effect of the larger global crisis (Portugal is the other country). "Welfare comma" - what a great way to put it! Will try to use it (with attribution of course!). "memorandum failing before [recte: "because"?] its conception is bad"
The one major recommendation in the memorandum is PRIVATIZATION. They should start dumping just about everything from government control. They could stop short of the armed forces, police and tax collection. And they probably can't do education. But they could dump everything else. Let the private sector streamline the industries - it is what they do best. Also I found out to my surprise that the Greek constitution specified that parliament (House of representatives) must have 200 to 300 members. So they could cut the MP's down to 200 without ANY change to the constitution. Finally they could issue a government bond available to anyone (not just the banks) make the interest taxed at source. A 20% bond would be cheap for the national bank, and excellent interest for anyone who still has money here (they do exist) - I mean what the worst that can happen you don't sell the bond and you have to sell it to the banks at 50% ? All these ideas are politically unsavory but we won't get out of this crisis doing what is politically palitable. Pulling out of the Eurozone and readopting a new drachma may put macroeconomics back into balance, but would only serve to mask the underlying inefficiencies and structural problems that the IMF and EC have identified. Greece has the opportunity to make tremendous strides in "structural" or "institutional" reforms. But there are many impediments to making such changes. Some consider that Greeks simply lack the technical capacity / knowhow to make significant changes. While this might have more than a kernel of truth, it should not pose an insurmountable hurdle. I work regularly with developing countries, and many succeed in making reforms rapidly and competently. For example, Greece's neighbor to the north in Skopje and the country of Georgia regularly are top reformers in the Doing Business survey. My suspicion is that those who lead ministries choose not to vigorously implement and adopt reforms. This stems from the fact that ministries are usually led by MPs with national political agendas. These MPs have usually shortlived tenure over ministries because elections and reshuffles of cabinets occur frequently. So ministries wind up becoming dominated by politicians' whims and the particular constituencies that support them. What is so refreshing is that the technocratic PM Papdemos is -- at least for now -- much more popular than any traditional party politician. Let's see if this persists, and whether elections are postponed much beyond the February 17 date that Antonis Samaras is demanding. Stuart and Nick - thanks for your comments - as always, they are spot on!